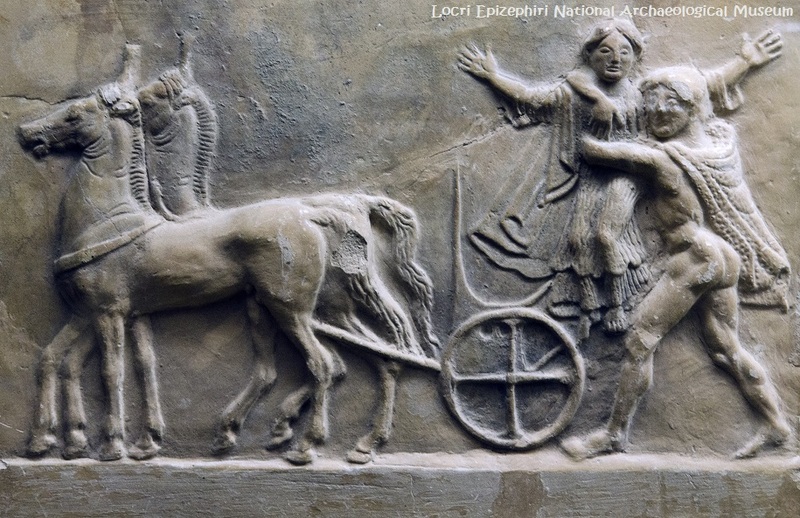 Highlights of a times when the complex web of Greek mythology was part of the daily life of the ancients. Some of the best Greek and archeological finds and artifacts are to be found in Southern Italy, including great figures such as Pythagoras, Archimede and Aeschylus. 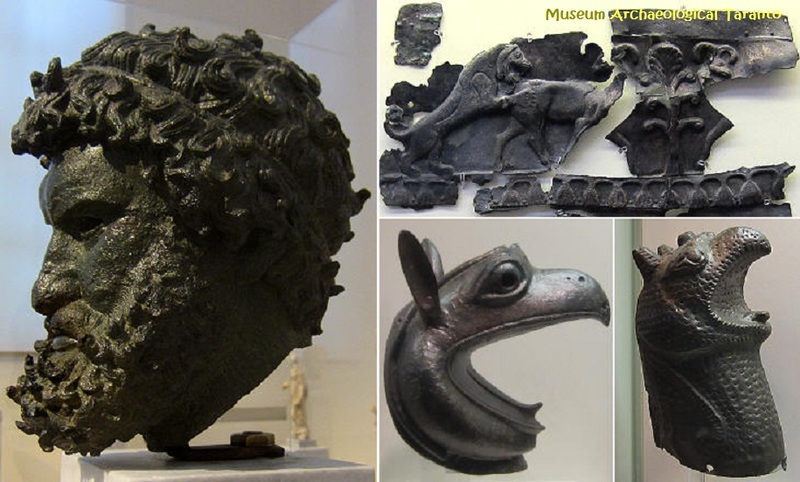 Many of those finds are exhibited in the museums of Naples (Campania), Mataponto in Basilicata, Taranto (Apulia) Reggio di Calabria, Locri (Calabria) and Syracuse in Sicily. More modern architecture styles such as the Romanesque and Barocco can be admired in the regions of Campania, Apulia and Sicily. 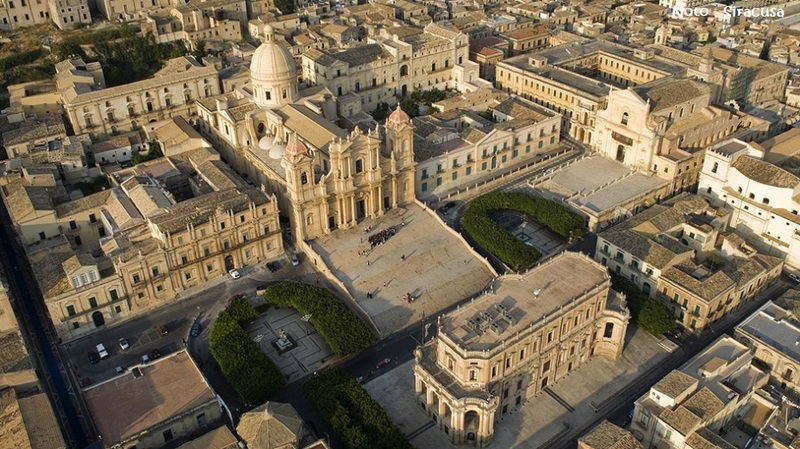 From the villas and palaces of Naples and Sicily, to the Barocco churches of Lecce, Trani, Molfetta and Canosa . Though in Sicily is more vivacious, Neapolitan Barocco is more sophisticated and displays a greater use of space. 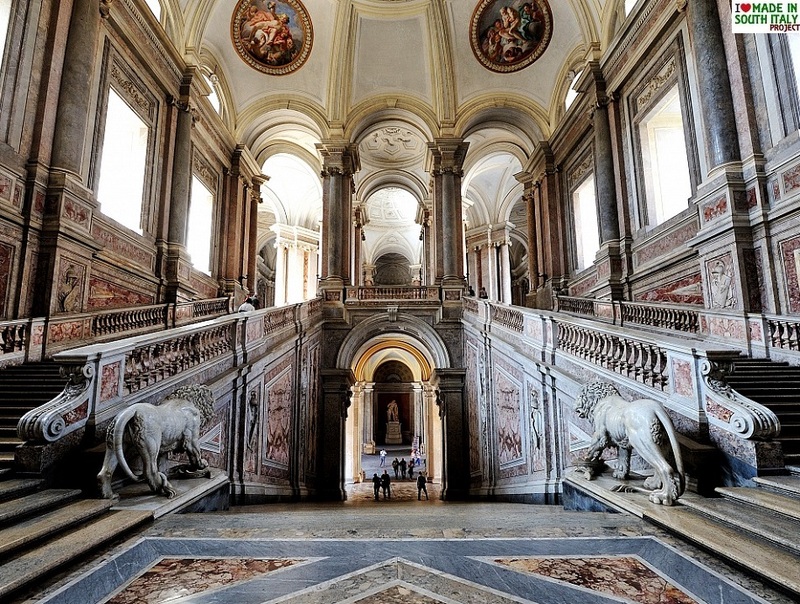 The sumptuous Royal Palace (Reggia di Caserta) and its richly decorated interior is a fine example. The stunning Charthusian monastery (14 th century) turned museum is literally a high point of Neapolitan baroque containing a feast of Naples greatest 17 th century artists. The skulls, well in sight, as a reminder to the monks of men mortality. 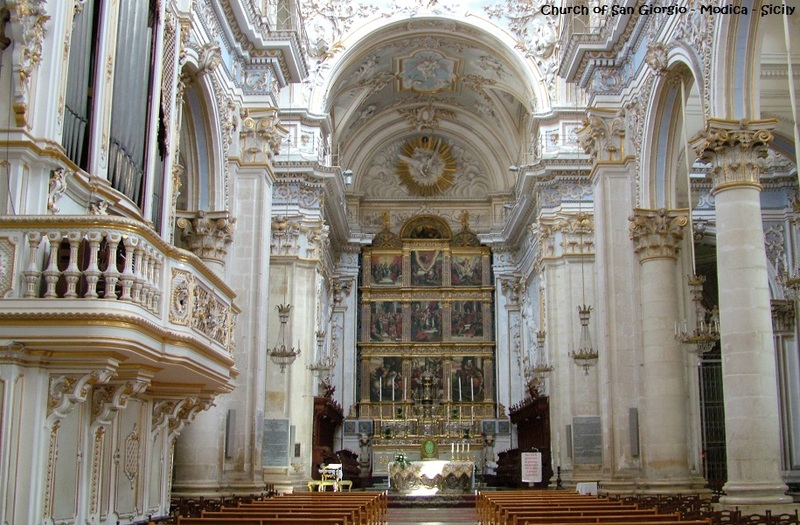 The Romanesque style of southern Italy owes much to the Norman, who in the 11th century brought from France both form and style in architecture and sculpture. In the southeast, the style has hefty Byzantine overtones; in Sicily it is characterized by strong traditional Islamic motifs and a love for rich color, pattern, and ornamentation. 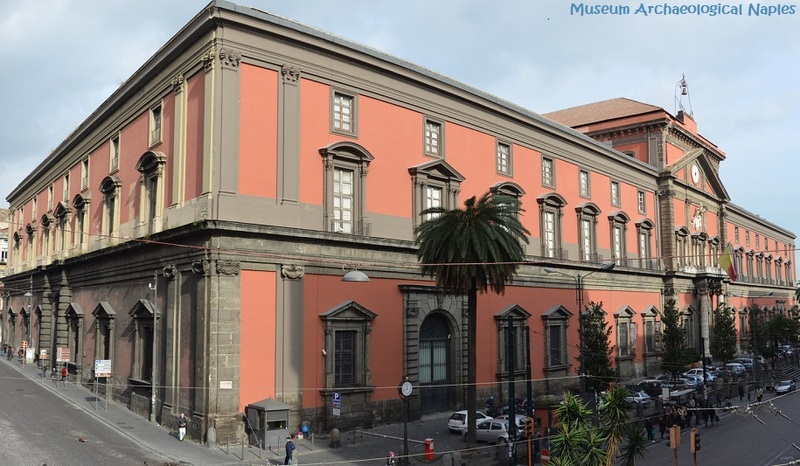 Naples Archaeological Museum contains a large collection of Roman artifacts from Pompeii, Stabiae and Herculaneum. The collection includes works of the highest quality produced in Greek, Roman and Renaissance times. 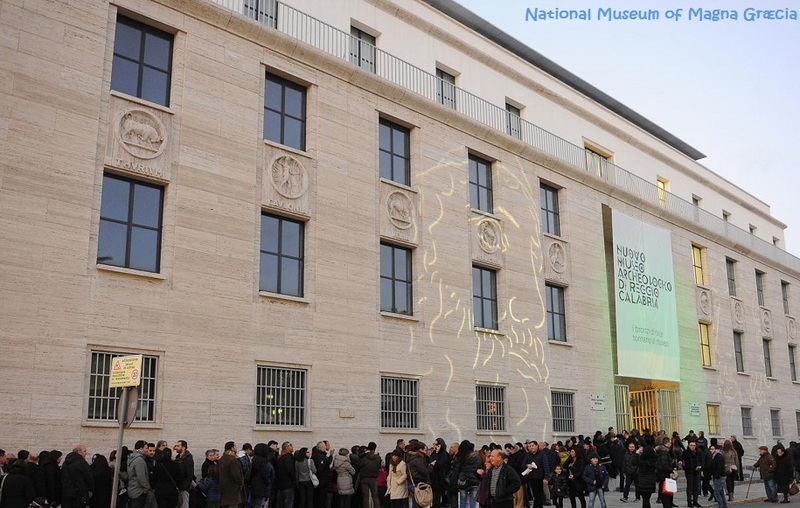 It is the most important Italian archaeological museum and is considered one of the most important in the world. 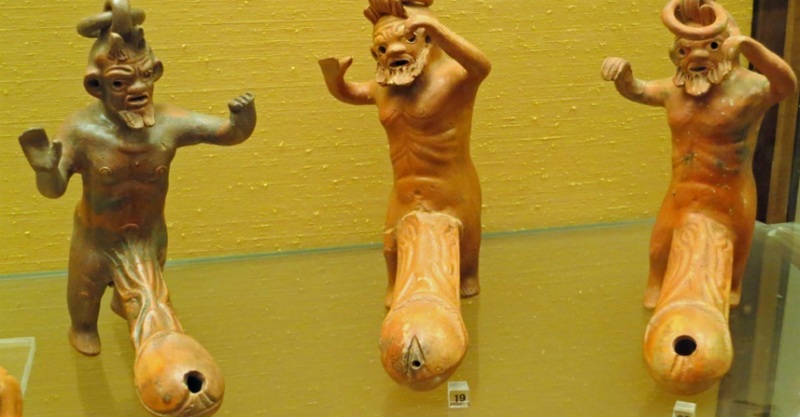 A collection of sexually explicit finds from Pompei locked away for decades in the 'Secret Cabinet' (Gabinetto Segreto) can now be seen in a discretely separated room at the Naples National Archaeological Museum. Paestum was a colony founded by Greeks fleeing the city of Crotone (Calabria) in the 6th century BC. It was dedicated to Poseidon, God of the sea. The 3 magnificent temples ( Hera, Neptune and Ceres) are Europe's most well preserved Greek ruins. It can be easily said that the Archaeological Museum of Paestum (Salerno province) is a compliment to the classic temples in the archaeological park just a few steps away. Probably the best ancient temples you have ever seen. 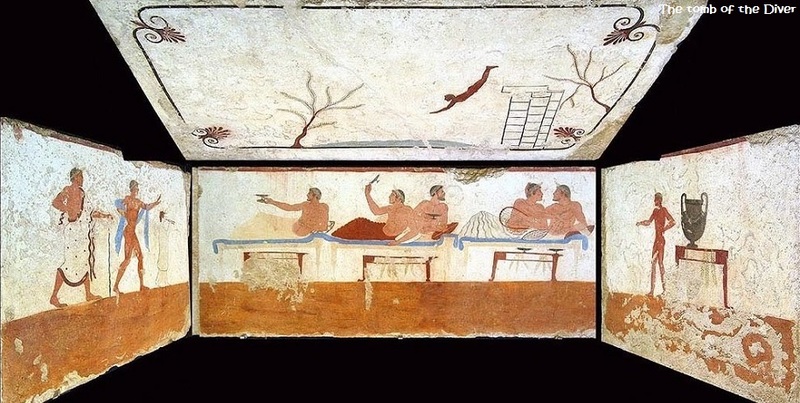 The Museum brings Paestum and Greek civilization to life with an array of artifacts, frescoes etc. which provide a great insight into the life of the ancient Greeks. Many displays illustrate what the temples would have looked like in their original state. Maybe there is not another place in the world where you can find such diversity of display as you find in a small city such as Paestum, anciently known as Poseidon. The cover slab, one of 5, of what we now know as the 'Tomb of the Diver', depicts a young man diving into a stream of water. A simple gesture lining multiple meanings. In psychological terms it might be interpreted as gesture of freedom, but also the challenge to embark on a journey of which you know little or perhaps nothing. The city of Metapontion where the museum is located , was home to Pythagoras on the run from the city of Crotone. Most of artifacts comes from the two sites of polis of Metapontion, the Agora area some 800 meters from the Museum building and the area of Temple of Hera at Tavole Palatine, some 4 kilometres away. Venusia, modern day Venosa, was supposedly one of many cities to be founded by the Greek hero Diomedes after the Trojan War. He dedicated Venusia to the goddess Aphrodite, also known as Venus, to appease her after the Trojans were defeated. 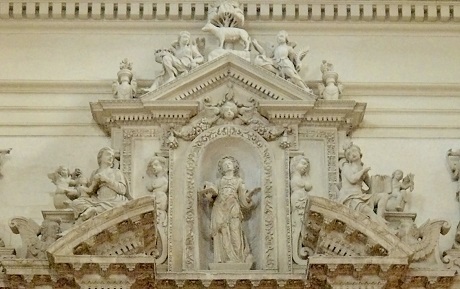 Lecce Baroque is a form of art and architecture developed between the end of the sixteenth century and the first half of the eighteenth century, especially in Lecce and the rest of Salento; It is recognized by the gaudy exteriors decorations that characterizes many public structures. The style, influenced by the Spanish artistic movement known as 'Plateresque', spread in Salento in the mid-seventeenth century thanks to the work of local architects Giuseppe Zimbalo (1617-1710) and Giuseppe Cino (1644-1722). During the seventeenth century the art took on new directions relinquishing the ancient classical form. The new style was meant to surprise and stimulate the imagination and fantasy. 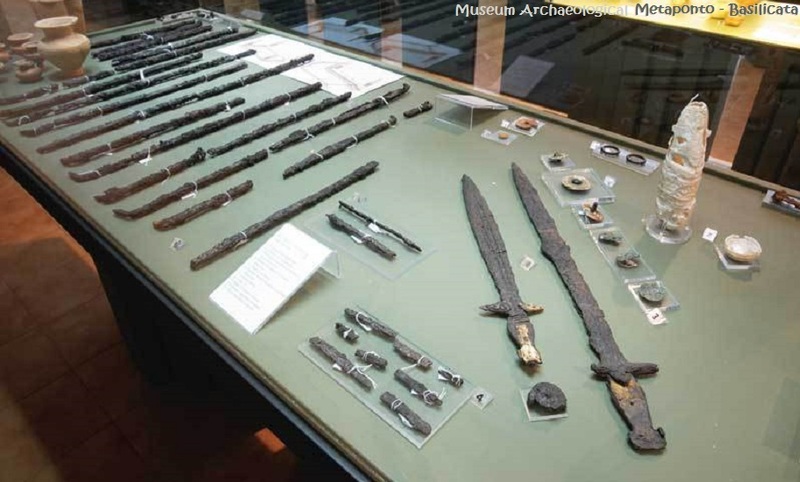 Taranto's museum is fascinating and full of Greek and Roman archaeological finds. It feature a rich and large collection of artifacts, jewelry, pottery, statues, mosaics, an immense archaeological trove. Taranto, known as Taras in ancient times, was founded by Spartan Greeks (8th century BC) and was to become a rich and powerful city. Was home to philosopher and scientist Archytas and to Aristoxenes author of the earliest treatise on music. 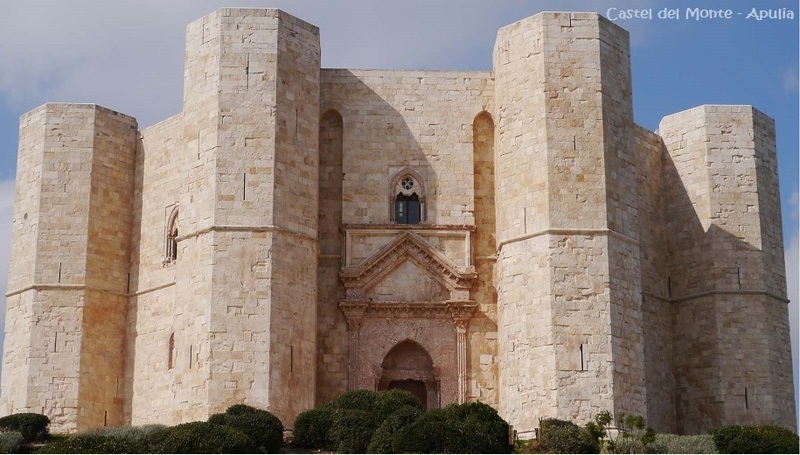 Castel del Monte (Adria municipality) built in the mid 13 the century by Frederic II, is said to be one of the most sophisticated secular structure of the Middle Ages. The site is protected as a World Heritage Site. In the heart of Salento, in the land of "Tarantismo and Saint Paul", in a village where legend and reality come together, a treasure chest full of jewels opens to the inquisitive traveler, displaying a breathtaking array of jewels. 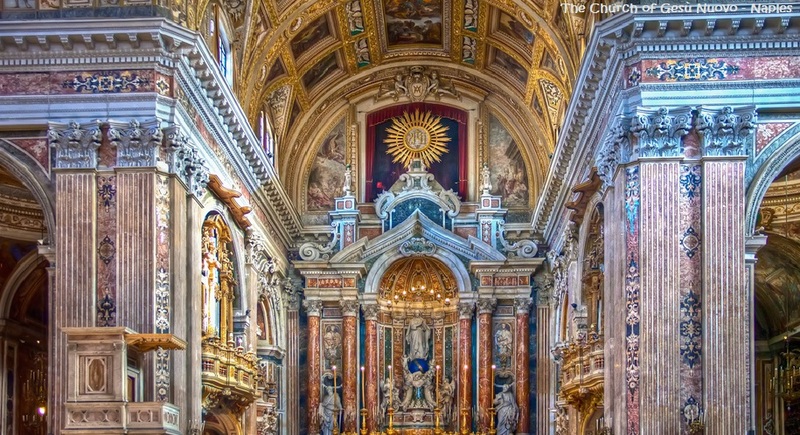 Here the Christian faith has created some of the finest masterpieces of religious art. 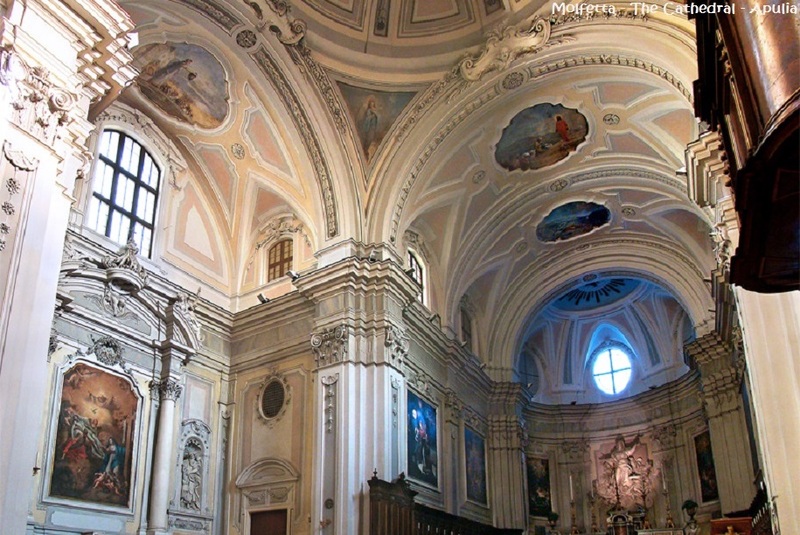 Wonderful frescoes that make you gasp, more then often, hidden in tiny churches. The Museo Nazionale della Magna Grecia (National Museum of Magna Græcia) located in Reggio di Calabria, features an extensive archaeological collection from sites in Magna Graecia. They are extremely important for studies of the 8th century BC, but also has several objects from the prehistoric and proto historic periods which preceded it and the ancient Roman and Byzantine eras which followed. 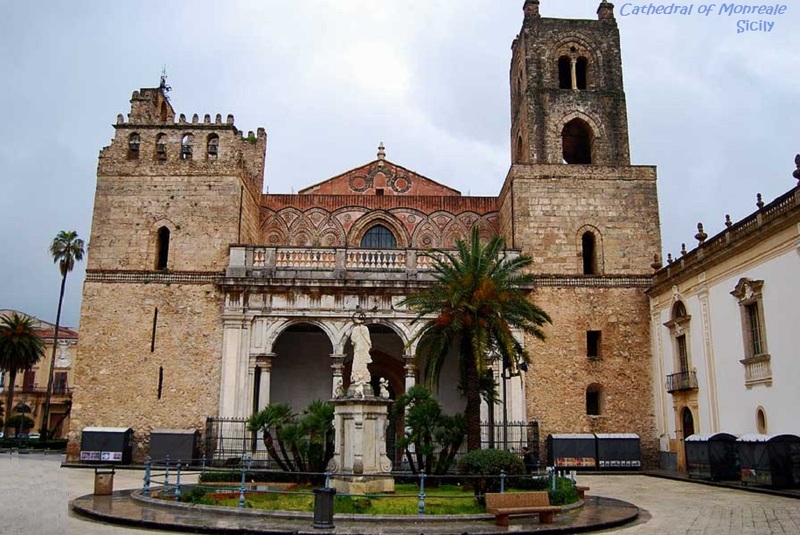 Today new finds in Calabria are no longer displayed and conserved in a single museum, but exhibited where they have been found, since the quantity of new discoveries has allowed smaller local museums to be set up for them (at Crotone, Locri, Roccelletta di Borgia, Sibari, Vibo Valentia and Lamezia Terme). The most antique objects, coming from the Lower Paleolithic date back to 600,000 years ago, are “choppers” (splintered rocks), found near Casella di Maida in the center of Calabria. 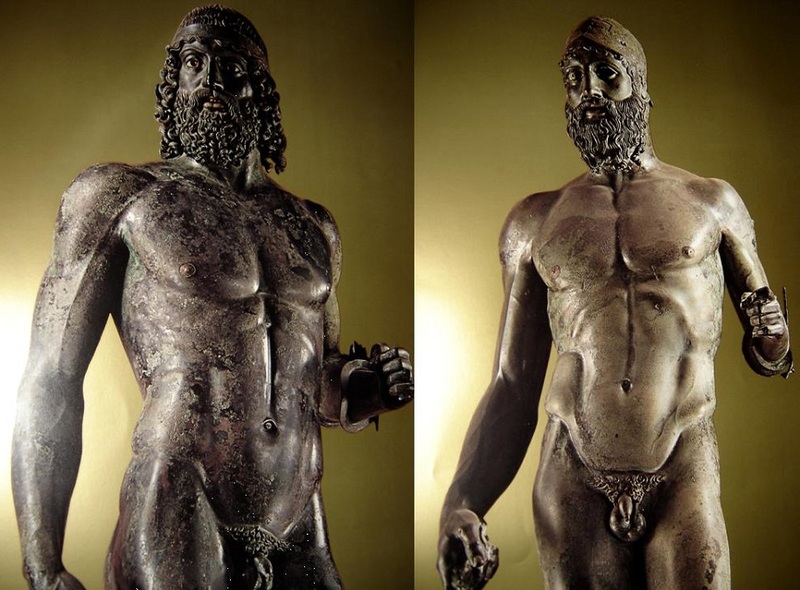 But the main attraction are the Bronzi of Riaci...also known as the "Two Warriors". We found them resting in the blue waters of the Ionian sea one day back in August 1972, but we have yet to find out who they are, where they came from or where they were going to. 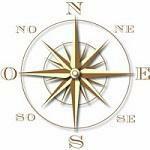 In about 540 B C, Kroton became the chef school of Pythagoras's philosophy. Here the great thinker and mathematician remained for 30 years until he was expelled following the overthrown of the local government. The pantheon of super heroes are all here: Homer, Calypso. Ulysses and even Hannibal built a lookout tower. Items on view are pottery, ceramics and coins from the Temple of Hera Lacinia. Crotone specializes in filigree work, onyx , coins and jewel reproduction. Locri Epizephiri National Archaeological Museum located just outside the city of Locri . The museum is filled with many amazing artifacts found during excavations (Pinakes, vessels, amphoras, etc..). Nearby are the ruins of a city which was once considered one of Italy's most important. 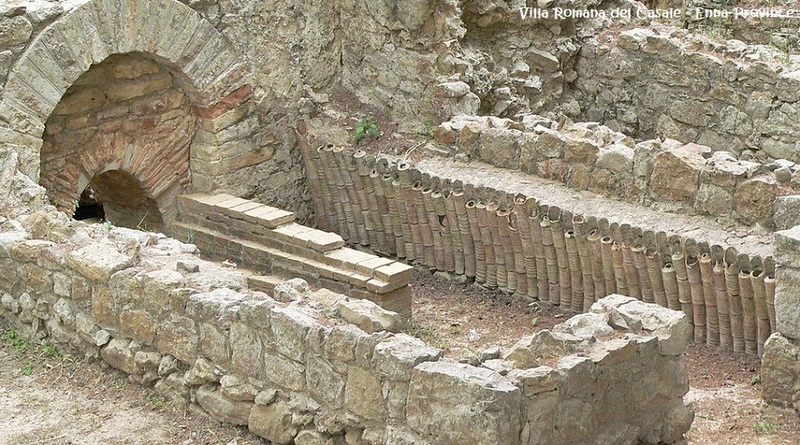 Don't miss the "Casino Macrì" dedicated to the Roman age and late antiquity archaeological finds. Locri Epizefiri was the first Greek city to have a written code of law. Here stands the ruins of Hera Lacinia, one of Magna Grecia's most important religious site (6th-5th century BC). Only one column of 48 still remains. The others , most probably, survived until the beginnings of the 16 century and were then used in other construction. 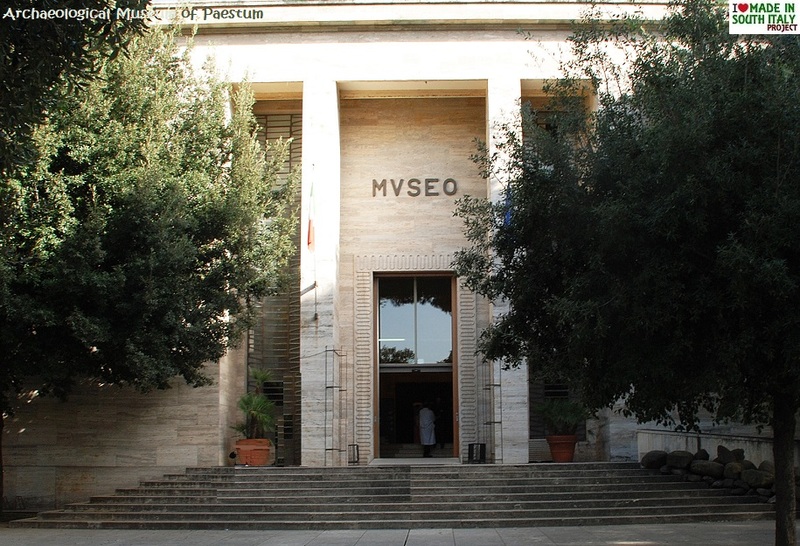 The Museo Archeologico Regionale Paolo Orsi of Syracuse (Syrakousai), is certainly one of the principal archaeological museums of Europe. It contains artefacts from the prehistoric, Greek and Roman periods found in local archaeological excavations in the city and other sites in Sicily. The space is divided into four sectors (A – D) and a central space (Area 1) which is dedicated to the history of the museum and briefly overviews the material displayed in the individual sectors. 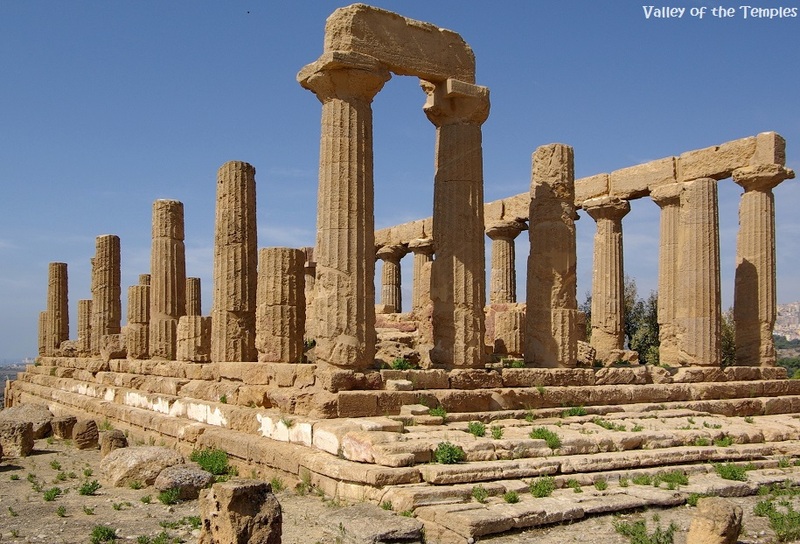 Sicily was colonized by Greeks in the 8th century BC. Initially, this was restricted to the eastern and southern parts of the island. The most important colony was established at Syracuse in 734 BC. Other important Greek colonies were Gela, Akragas, Selinunte, Himera, Kamarina and Zancle or Messene (modern- day Messina, not to be confused with the ancient city of Messene in Messenia, Greece). Said to be burial site of a nearby prehistoric village dating back to the 13 th/8 th century BC . 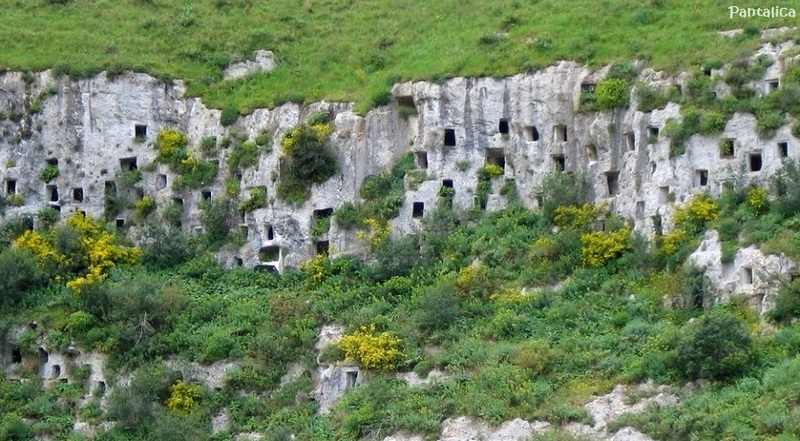 The necropolis of Pantalica is located on the Iblei mountains in the provinces of Ragusa, Siracusa and Catania. Digs suggest that the abandoned site was reinhabited in the Byzantine period by monk, when many of the tombs were made into cave dwellings and chapels. Ancient Syracuse must have been the epicenter of the art and culture of Magna Grecia and was considered to be the most fascinating city of the ancient world. Still today the city is regarded as the 'Greek drama center' outside Athens, with elaborated productions staged in summer months in the Greek Theater (Teatro Greco). 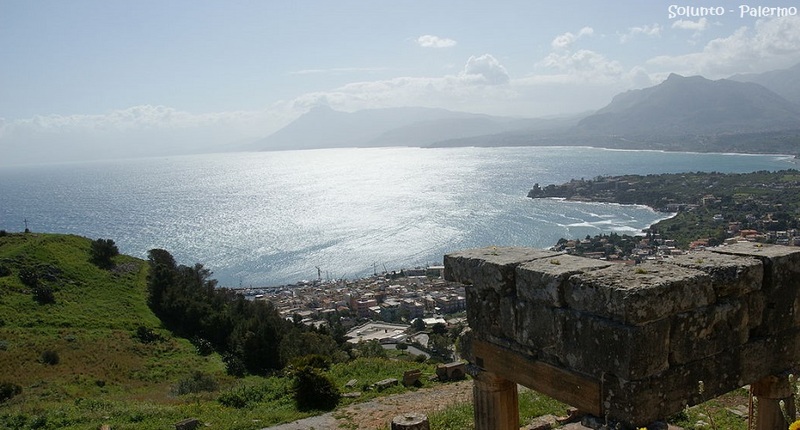 A trip to this corner of Sicily arouses deep feelings, like crossing the border of time and go back a thousand years. Not far from Siracusa is Noto, at the foot of the Iblea Mountains, giving the name to the valley, known as Val di Noto. Ancient Noto lies 8 Km away on Mount Alveria.According to legend, Daedalus stopped here after his flight over the Ionian Sea, as well as Hercules, after his seventh task. The Valley of the temples, the ancient Greek wonder, stands below the medieval city of Agrigento (ancient Akragas in Greek). 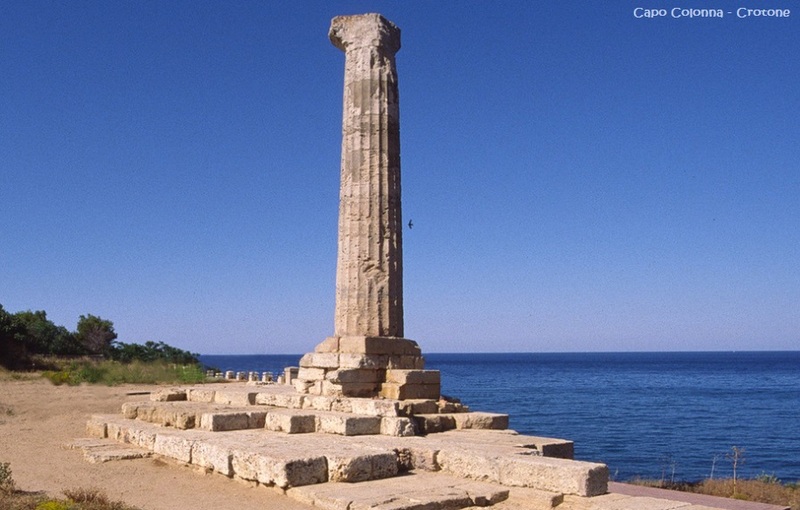 Here five magnificent Doric temples are lined up overlooking the not so distant blue waters of Mediterranean Sea, as to greet the returning sailors. The archaeological site of Valley of the Temples, (the term "valley" is a misnomer) is another outstanding examples of Greater Greece art and architecture. The area was included in the UNESCO Heritage Site list in 1997. 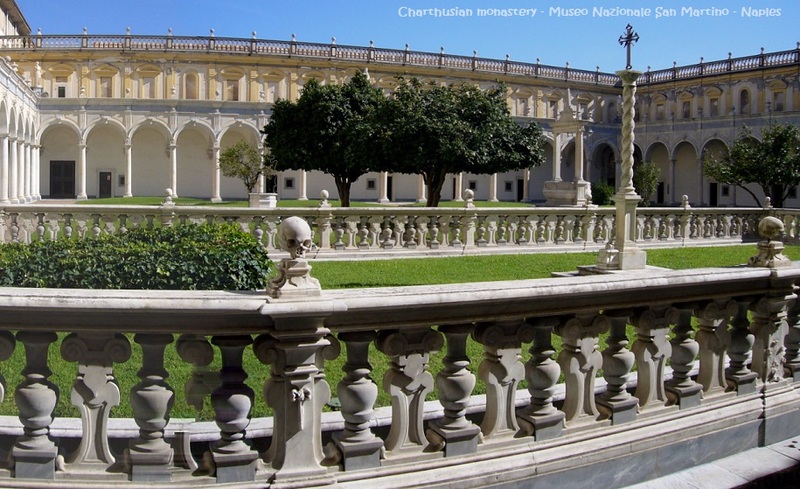 The archaeological park is the largest archaeological site in the world with 1,300 hectares. 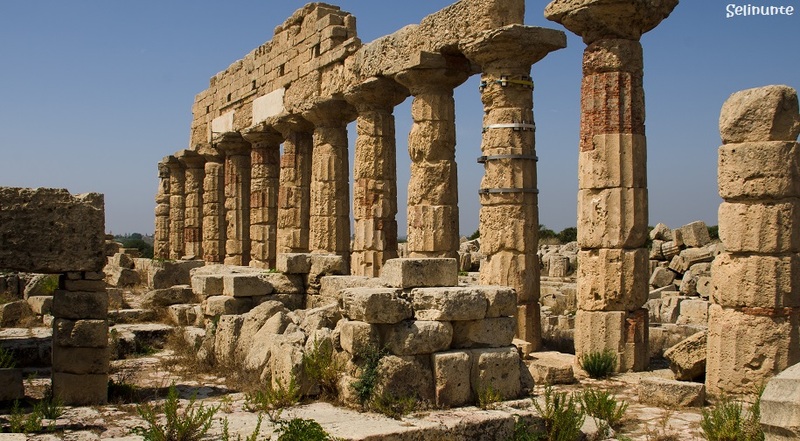 Selinunte ( Trapani province) is believed to have been founded by archaic greeks in 650 BC to be destroyed almost 400 years later by the Carthaginians. Segesta was inhabited by the Elymian people, one of the three indigenous peoples of Sicily during the Bronze Age and Classical antiquity. It was destroyed by the Vandals. Current archaeological work indicates that the site was reoccupied by a Muslim community in the Norman period. Little is known about the city under Roman rule, but it is probable that the population gradually moved to the port city of Castellammare due to better trading opportunities. The hilltop offers a view over the valley towards the Gulf . The city controlled several major roads between the coast to the north and the hinterland. Soluntum or Solus, one of the three chief Phoenician settlements in the island, situated to the east of Cape Zafferano. Soluntum was one of the few colonies that the Phoenicians retained when they gave way before the advance of the Greek colonies in Sicily. Excavations have brought to light considerable remains of the ancient town, belonging entirely to the Roman period, and a good deal still remains unexplored. An archaic oriental Artemis sitting between a lion and a panther, found here, is in the museum at Palermo, with other antiquities from this site. An inscription, erected by the citizens in honor of Fulvia Plautilla, the wife of Caracalla, was found there in 1857. The Villa Romana del Casale a Piazza Armerina (Enna - four km from Piazza Armerina) although not the classic aristocratic roman villa, it does have the characteristics of a suburban imperial palace . The overall plan of the villa reflects a time when the Roman Empire was mostly based on the exploitation of the rural economy when most of the hard work was performed by slaves. 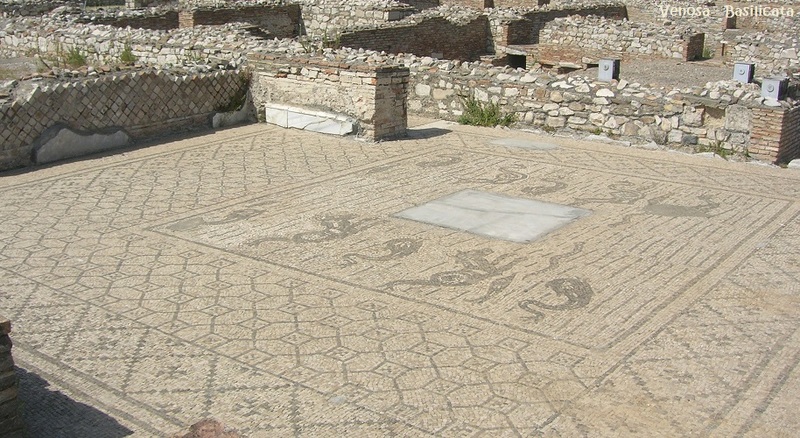 Decorations such as the several masterly executed mosaics, finest mosaics anywhere in the Roman world, and luxury private quarters suggest that the villa was owned by a rich Roman Patrician, the Roman ruling class. Below, a view of thermal baths complex. The Nuraghi is a settlement consisting of a seventeenth century BCE , with a central bastion, corner towers and a village built around it with dry stones walls and conical roofs made of wood and branches, strategically connected to other Nuraghes. They are considered by scholars the most impressive expression of the Nuragic civilization and were included in the UNESCO list of World Heritage Sites in 1997. Abbasanta is a town in the province of Oristano. 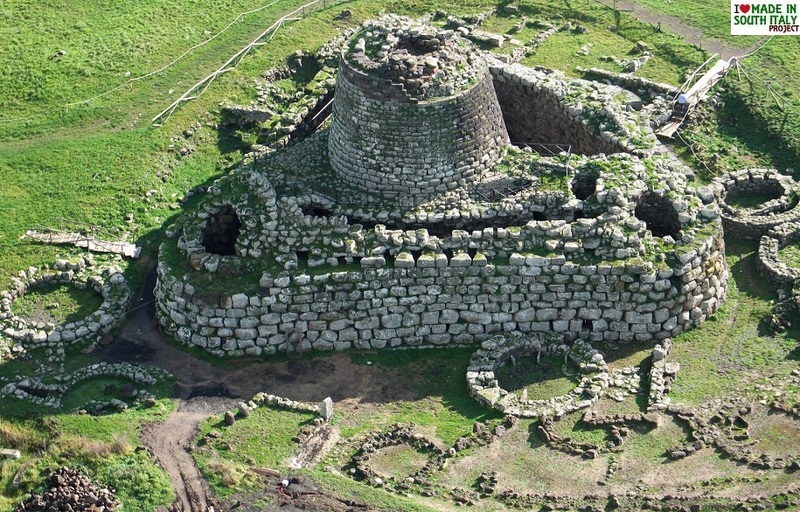 Neraby is an impressive stone structure know as Losa Nuraghe whose central tower dates back to 1000 BC. 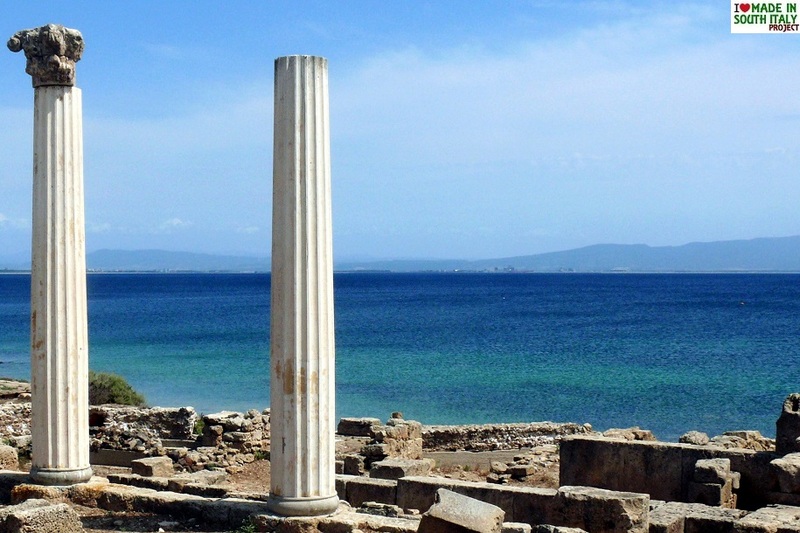 Tharros is an archaeological site near the village of San Giovanni di Sinis, on the west coast of Sardinia, in the Province of Oristano.The ancient city was founded by Phoenicians on the remains of a former village built by the nuragic peoples (1900-730 BC). 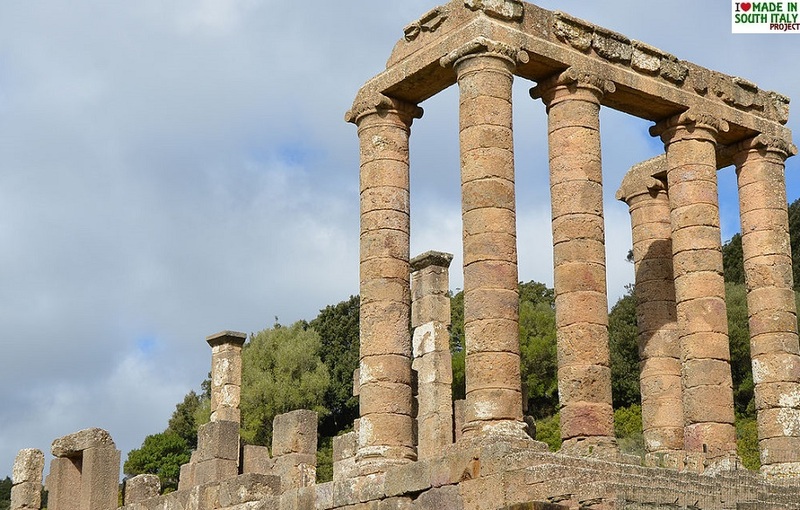 The Temple of Antas (Near the town of Fluminimaggiore - Carbonia -Iglesias province) consists of a Roman temple, built over the remains of the Carthaginian one. The archaeological area of the temple includes a small necropolis, remains of an ancient Nuragic village (13th-10th centuries BC), Roman quarries of limestone and an ancient path connecting the temple to a sacred cave where the water cult was practiced.